Below is a version of the History of French America. It is summarized content that can be found here in long form. If you have anything to add to this please make some comments below. n 1534 the French king, Francis I, sends Jacques Cartier – with two ships and sixty-one men – to look for a northwest passage linking the Atlantic, above the continent of America, with the Pacific. Cartier discovers the great inlet of the St Lawrence river, which he hopes will prove to be the mouth of a channel through the continent. He postpones the exploration until the next summer and returns to France. Meanwhile he claims the whole region for his king, under the title New France. The founder of Quebec in 1608, Samuel de Champlain, works ceaselessly to explore the region and to build up the French fur trade with the help of the Huron Indians. But progress is slow. By the time of Champlain‘s death, in 1635, the settlers in Quebec number fewer than 100. And this is in spite of the personal involvement of Richelieu. During the 1660s more than 3000 colonists are sent out, including a due proportion of girls of marriageable age. The decade proves a turning point for New France. The level of population reaches a point where it is able to increase by natural growth (most of the inhabitants of the thriving French colony in the next century descend from this first major influx of settlers), and explorers now begin the process of pressing west and south from the Great Lakes. As the French explore through and around the Great Lakes, they begin also to move down the rivers running south from this region. Robert de La Salle explores the Ohio valley during 1669, in a journey which provides the basis for the later French claim to this area. Four years later a much more dramatic expedition is undertaken by a trader, Louis Jolliet, and a Jesuit priest, Jacques Marquette (founder in 1668 of the mission at Sault Sainte Marie). With five companions, in 1673, they make their way round Lake Michigan in two birch bark canoes. From Green Bay they paddle up the Fox river, before carrying their canoes overland to the Wisconsin and thus on to the Mississippi. They travel down the Mississippi as far as its junction with the Arkansas river, by which time they are convinced that it must flow into the Gulf of Mexico rather than the Pacific. With this information they make their way back to Lake Michigan. Inspired by their example, La Salle becomes determined to reach the mouth of the Mississippi. After two false starts, several disasters and a long struggle for funds, he finally achieves the task in 1682. At the mouth of the great river he claims possession for France of the entire region drained by the Mississippi and its many tributaries, naming it Louisiana – in honour of his monarch, Louis XIV. It is some time before the southern region becomes a desirable colony. The situation changes dramatically in the 18th century. The main clash is between the French and the English. The two nations are at war with each other in Europe almost constantly from 1689 (in the wars of the Grand Alliance, the Spanish Succession, the Austrian Succession). This is inevitably reflected in relationships between their neighbouring American colonies. But a more direct cause for conflict in north America derives from the interest of each colonial group in the Ohio valley. 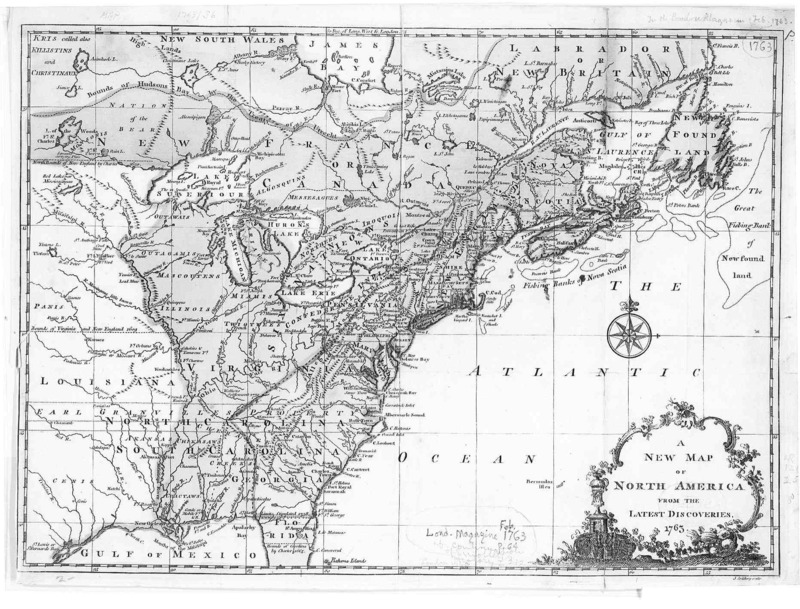 For the French this region is the first route southwards, running west of the Appalachians. For the British it is the first region available for expansion beyond the Appalachians. As such it is steadily encroached upon by English colonists, eager for new territory in which to trade and settle. The sensitive nature of the Ohio valley becomes evident in 1749, when a French official is sent down the river to set into the landscape, at regular intervals, embossed lead plates stating the ownership of the land. They declare that it belongs to the king of France. Hostility turns to violence in 1752, when the French destroy a British trading centre at Pickawillany. The government of Virginia regards this as part of its territory and has been granting land in this region to colonists. Its response, in 1753, is to send an officer to warn the French of impending reprisals if they do not withdraw. The choice for this difficult mission falls on a 21-year-old, George Washington. When Washington delivers his message to the officer in charge, he is politely but firmly told that the French intend to occupy the entire Ohio valley. He leaves and returns with 160 soliders and makes a surpirse attack and this is the start of what the English call the French and Indian War. When Washington meets the main French force, he is outnumbered and he surrenders. In February 1755 Edward Braddock lands with a British army. Washington becomes his personal aide-de-camp. Braddock and Washington head west through the Allegheny mountains from Fort Cumberland, but the two generals are no more successful than Washington alone in recovering Fort Duquesne. Their army is ambushed by the French in July 1755 and Braddock is killed. The broad battlefield is the border territory between French and British America – east of Lake Ontario and north of Albany. Here the French take several important British frontier posts, largely thanks to the skills of the marquis of Montcalm who arrives in the summer of 1756 to command the French armies in America. By now the French threat to the British colonies seems overwhelming. The western regions of New York, Pennsylvania, Maryland and Virginia are almost deserted as settlers flee to safety from marauding parties of the French or their Indian allies. But the tide is about to turn. The second half of 1758 brings British victories. By this time the conflict is part of the wider Seven Years’ War. The changing fortunes of the British in north America in 1758-9 are largely due to the energy and skill of the man who in the summer of 1757 becomes secretary of state with responsibility for the war – William Pitt, known as Pitt the Elder (or, later, earl of Chatham). Pitt builds up Britain’s navy and selects talented commanders on both sea and land. The French capture of Fort Duquesne in 1754 began the war in America. Now four years later, on the advance of a British army (once again with George Washington commanding a contingent), the French burn their wooden fort and abandon the site. The commander of the British army writes to inform Pitt that he is giving the place a new name – Pittsburgh. The stage is now set for a final assault on the very heart of New France, the original settlements of Montreal and Quebec.